Today I put up the next (second) adventure in the three part Heroes of Hackston series. 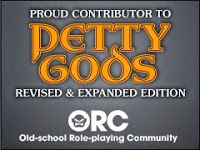 I originally wrote these adventures for use as a local convention game and ran them again at the Origins Game Fair in either 2005 or 2006. 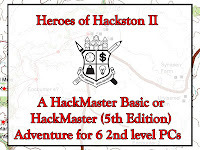 Two years ago I updated the adventures for the current edition of HackMaster, but they required a bit more editing and formatting to make them available for other GMs to use. If one of my twelve readers is willing to write a review I'd be more than happy to provide a comp copy.